MCMC Fragrances is an indie line founded last year by Anne McClain, whom some of you may remember from the Humanity perfume and Humanity fountain announced earlier this year (McClain also runs the "First Monday" classes at Le Labo). In addition to Humanity, the line now has four other fragrances on the market: Noble, Maine, Hunter and Garden. 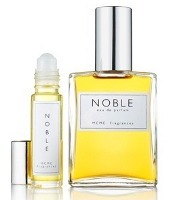 Noble (Stories collection, shown above) ~ "Long before formal training, Anne was toying with the sensual, intoxicating scent of Indian jasmine absolute and combining it with the fiery, earthy vetiver oil of Haiti...Combined with rich almondy notes of chai tea, burning incense, amber and musk, the jasmine-centered Noble is a long-lasting floral woody with an ethereal drydown." Maine (Stories collection) ~ "Maine is inspired by a day spent on the island of North Haven off the coast of Maine, falling in love. Bulgarian rose absolute, local clary sage, wild Somalian myrhh and French seaweed absolute convey the fresh scents of sea, air, sun, pine, and the discovery of a single perfect rugosa rose. Dries down into the musky scent of sensual skin coupled with sun-dried grass." Hunter (Stories collection) ~ "When Anne was younger she had a friend named Harrison, who she liked to call Hunter. He lent her the book Ishmael, and played guitar, and taught her about loving the environment. Years later, memories of their long friendship and his adventures building maple sugar cabins in Vermont inspired the fragrance Hunter. With tobacco absolute, organic Bourbon vanilla and fir balsam, this fragrance is best if worn with a flannel shirt." Noble, Maine and Hunter are available in 50 ml Eau de Parfum or 10 ml oil-based roll-on. Garden ~ "...inspired by the Ananda Harvest, a group of urban farmers who come together each weekend in upstate New York to teach themselves and others how to farm...essential oils of red thyme, myrtle, lavender, lemon and bitter orange, the fragrance wears well on both men and women." Garden is 88% certified organic, and half the proceeds will go to Ananda Harvest. Garden is available in 10 ml oil-based roll-on. All of the fragrances can be ordered at the MCMC fragrances website. I thought Humanity was lovely, looking forward to trying these! If you try them, do report back! I’m esp. curious about Noble, that sounds wonderful to me. Each of these sounds fantastic to me! I may scoot over to Brooklyn on my next trip to NYC. Then ditto what I said above — do report back! I may have to try Maine! Me too! I spend most of my summers at a tiny cottage on the coast of Maine, and even reading that perfume description made me long to be there RIGHT NOW. I’m not so sure about the Somalian myrrh, though. Personally, I might trade that out for some beautifully-oiled old ship wood, salty and warm, but what the heck do I know? Either way, I’ll be excited to give it a sniff! That one sounds interesting too. The CEO and I honeymooned in Maine… I think it’s going on my test list.